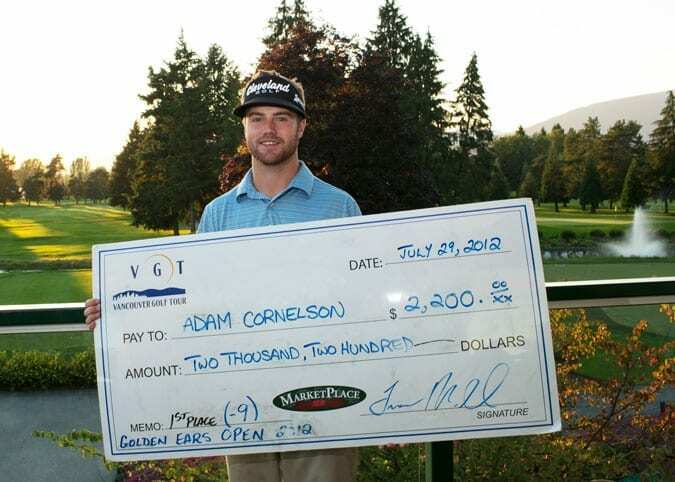 “Adam Cornelson did what it took to slay VGT’s top Professional (Bryn Parry) on Sunday at this weekend’s Golden Ears Open at Pitt Meadows Golf Club – Patience and consistently good play! Cornelson battled 216 golfers over the 36 hole event, including 38 of BC’s top Pros in the field. He would share the tournament lead after 18 holes with fellow Canadian Tour pro Matt Daniel, both shooting scores of 66. 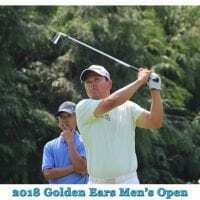 Daniel would falter on day two with a score of 76 to finish in a tie for 12th. 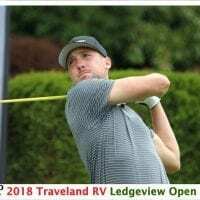 Early challengers on day two were Chilliwack Assistant Pro Brad Clapp, who opened with a 70 on day one, and turned the nine on day two at 32 for a 27 hole score of -6. At the time Clapp was within 1 shot of the lead, but bogeys on 10 and 13 would end his chances of becoming the Champion and he finished in a tie for 4th at -5. Other than a back nine charge of 32 (-4) by Can Tour’s Ryan Williams, who would finish t2nd (-6), this year’s Golden Ears Open event turned into a 2-man duel between 4-time Order of Merit Winner Bryn Parry and Cornelson. Parry gave Cornelson a good scare on the front nine when he made birdies on 3 and 5. And when he made two more birdies on 10 and 11, it was a one-shot tournament with 7 to play. Cornelson traded a bogey and birdie on 13 and 14, but continued his steady play tee-to-green, giving himself good looks at birdie on 15 and 17, and when Parry failed to get it up and down from in front of the 17th green, he would stand on the 18th par 5 with a 2 shot lead. Another solid drive and long iron safely into the middle of the green left Cornelson a 30 footer for eagle, and ultimately game over. Parry did nearly one-hop his pitch in the cup, but it slid 6 feet past the hole and he would miss his birdie chance, finishing in a tie for 2nd with Ryan Williams at -6. When Cornelson tapped in his 1 foot putt, he was declared the Champion with a 3-shot victory and a $2,200 winner’s cheque! The 24 year old graduate from University of New Orleans has been making steady improvement the past 3 years of his career since graduation. Cornelson started his winning ways on the VGT in his first event, the 2009 Vancouver Open where he won Low Amateur honors. He went onto win 2 more VGT events in 2010 (Nickel Heating Open and Swan-e-set Classic) as an amateur before turning Professional in the fall of 2010. 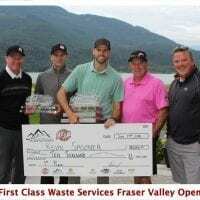 His professional debut resulted in a t21st finish at the Vancouver Open and a cheque for $255. Since his pro debut, Cornelson has been on the steady track to some success in his professional career, earning his Canadian Tour card in the April of 2011. He would make 6 cuts of 10 that he played last year with his best finish a t27th at the ATB Financial Classic. But more importantly, he was making cuts, and whenever he was not on the Canadian Tour, he was learning on the VGT. Finally his first Professional win would come at last year’s Hadassah Wizo Pro-am at Richmond Country Club where he shot an amazing round of 63 and his biggest Professional cheque to date ($2,000). A number of top 10’s on the VGT (5), including a runner-up finish at the Golden Ears and a t9th finish at the Paine Edmonds Vancouver Open kept him believing his game was improving….slowly but surely. This year has been even more of the same, as Cornelson has made 4 out of the 5 cuts he’s played in on the Canadian Tour, with his best finish a t16th at the Times Colonist Island Savings Open. He has already surpassed his 2011 earnings on both the Canadian Tour and Vancouver Golf Tour ($12,000 for both tours), and has yet to have a finish out of the top 6 on the VGT. (Well, unless we counted an unfortunate DQ in his last VGT event where he rushed off after signing his card at the RBC Pro-am…..only to find out he had signed for an incorrect score…….which he would later tweet that he would ‘Make up for my RBC blunder at this week’s Golden Ears Open’. Guess he was right! On the whole, THIS Adam (not to be mistaken for VGT’s most successful alumni Adam Hadwin) looks promising to be one of the next bright young BC golfers to join Hadwin to waive the Canadian Flag out on a major tour very soon! Cornelson will head back east to play two Canadian Tour events before travelling home to improve on last year’s t9th finish at the Paine Edmonds Vancouver Open. With the straightness and distance he was hitting his drives with his new CLEVELAND CLASSIC Driver, I’m thinking he’ll do just fine! 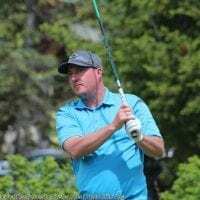 The 2011 Golden Ears Open Champ Carrey has been travelling out on the Canadian Tour for his second season this year and has been making most of the cuts this year, but yet to have that big breakthrough event. Carrey’s 2010 season on the Can Tour was definitely his best to date, finishing in 7th place and taking home a cheque for $10,075.00. He currently sits 38th on the Can Tour Order of merit through 7 events and will head back to Ontario for the last couple of Can Tour events to find his first big ‘W’ on the tour. Carrey sits in 9th place on the VGT Order of Merit after only playing in 4 events, the last three of which have been top 5 finishes. Signs of good things to come in his final two Canadian Tour events no doubt! In the amateur side of the tournament, a great battle ensued between local member Ryan Brooks and two regular VGT amateurs (Colin Gilliam and Brendan Dillon). With 3 holes, it appeared Brooks has things all locked up as he had a 2 shot lead over both Gilliam and Dillon. But a bogey on 16 and double bogey on 17, and an eagle putt that lipped out from 8 feet, left Brooks in a tie for 2nd at Even par for the tournament. 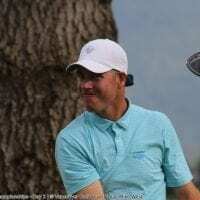 It was Vancouver Golf Club’s Brendan Dillon who survived the longest on back nine, and when he birdied his final hole it was good for a one shot victory in the Amateur Championship. This was amazingly Dillon’s 5th Amateur win on the VGT schedule, all but locking up his Cleveland/Srixon Order of Merit Title with only a handful of VGT events remaining. Special thanks must go out to Tournament Chair Frank Hoadley and Scoring Chairman Steve Chapman and the over 40 Pitt Meadows Golf Club members and volunteers for their extraordinary efforts throughout the weekend making this year’s Golden Ears Invitational a great event. The golf course was in great shape thanks to the efforts of Head Superintendent Dave Zeiler and his staff. Finally, we can’t forget to thank Pitt Meadow’s Head Professional Neil Roberts and his Pro-shop staff and GM Michael Pierce and the clubhouse team for the outstanding service they provide throughout the weekend for all competitors. Pitt Meadows Golf Club – Thanks for being involved with the Vancouver Golf Tour for the 5th straight year and believing that the experiences you are providing do in fact make a difference to young golfers’ lives in their quest to become PGA Tour Champions! For Order of Merit Standings, please CLICK HERE.